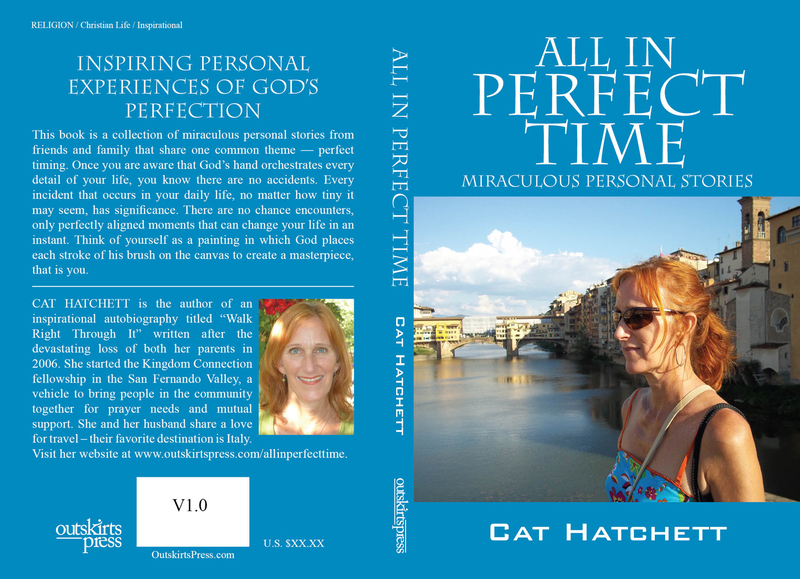 All in Perfect Time: Miraculous Personal Stories by Cat Hatchett is an inspirational collection of stories from people of all different faith backgrounds, nationalities, and cultures. Have you ever wondered if there was such a thing as “divine appointments”? Or maybe you believe everything happens by chance? No matter what your faith, through the words of this book you will be encouraged to believe that something exists beyond yourself and your immediate circumstances. That we are all here for something greater than we could have possibly dreamed up for ourselves. One of my favorite aspects of this book is that each story is short and simple. The book is easy to pick up and read here and there, and does not require any sort of time commitment. It would make a great gift book for sure, whether you’re a Christian or not. It would be difficult not to be spiritually uplifted and inspired through the amazing experiences recorded in this book. I recieved All in Perfect Time as a gift from a friend while I was going through some trying circumstances, and I found the stories within to be very encouraging and uplifting to my spirit. I was never asked to give a review or even share it with anyone, but chose to do so because I love the heart and ministry of the author and wanted to share that with you all. You can purchase the book on Amazon HERE. Cat Hatchett is the author of an inspirational autobiography titled “Walk Right Through It” written after the devastating loss of both of her parents in 2006. She started the Kingdom Connection fellowship in the San Fernando Valley, a vehicle to bring people in the community together for prayer needs and mutual support. You can visit her website HERE and follow her on Twitter HERE. I mailed out my Christmas cards one week early to ensure they would arrive before December 25th. On Christmas Eve, one of the cards was returned to me marked “unable to deliver”. I called my Aunt to inquire as to her new address in Michigan and also asked for her eldest daughter’s phone number. While growing up in Chicago, I only recall meeting my Aunt Margie and her five children one time in my life. They drove from Indiana to our house and spent the night when I was sixteen. I don’t know why we did not spend more time with our cousins but knew it was finally time to reconnect with them after all these years. I called my cousin Jill and left her a message the day after Christmas. She returned my call and we talked for 20 minutes to try and catch up on thirty years. Later that day, I also connected on FaceBook with my cousins Jodi and James. My younger sister also became their friends on FaceBook. We are all excited about meeting for a family reunion this summer at Lake Michigan. My parents always took my 3 sisters and me to the lake every summer. Revisiting that location would bring back a lot of fond memories. Plus it would be wonderful to create some new ones with our longlost cousins. season even if you have not spoken to them in months or even years. The results may surprise you! Have a blessed new year! An amazing chain of events occurred this Christmas Eve afternoon. I know without a doubt that God orchestrated the entire production. It began with a driver hitting the rear end of my husband’s car while he made his turn into the driveway at home. I arrived an hour later to survey the damage and ran to our neighbor to thank her for phoning the police after the accident. As I was leaving out of the gate from our neighbor’s home, I saw a familiar face! It was Aileen who attended my last church, Time In Destiny! She told me she was walking down our street looking for a building in which a place was available for rent. She had already arranged to meet the manager at the rental but then discovered it was located in the opposite direction. I told Aileen that I would accompany her to look at the property. We located the building only a block from our place and a kind woman walked out in front to meet us. She introduced herself as Gabriele. Gabriele showed us the unit and it was really full of potential. However, the tenant told us that he didn’t know if he could vacate the place by the end of the month. We walked over to Gabriele’s apartment and through our conversation discovered that she too is a Christian. To our surprise, the church she regularly attends is one that both Aileen and I have been drawn to visit for the past week. Coincidence? I don’t think so! Gabriele even led us in prayer that God would guide Aileen to choose the right place to move. I returned home after two hours and my husband asked where I had disappeared to. I relayed the amazing story to him and am still in awe of how God brought the three of us together. I received a message from Aileen a short time later saying that she was indeed going to move into Gabriele’s building and the current tenant had agreed to move out by the 31st! I am so excited and look forward to more fellowship with Aileen and Gabriele. Our God is so awesome and gives us all that we need and more! Have a blessed Christmas season and New Year! I was introduced to an incredible Christian writer this morning on FaceBook. You can follow her blog at http://rebeccaaarup.com. Her website contains wonderfully written articles: http://www.servantsisters.org. We are all connected through God! Take that first step and reach out to create a new relationship. It’s so worth it!